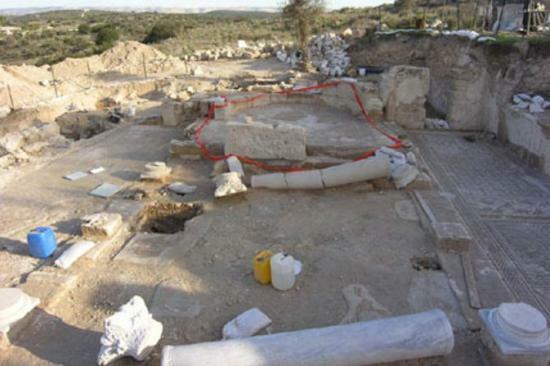 A large and beautiful mosaic floor and a church were uncovered in excavations carried out by the Israel Antiquities Authority at Hirbet Madras in the Judean coastal plain - possibly the residence and tomb of the prophet Zechariah. 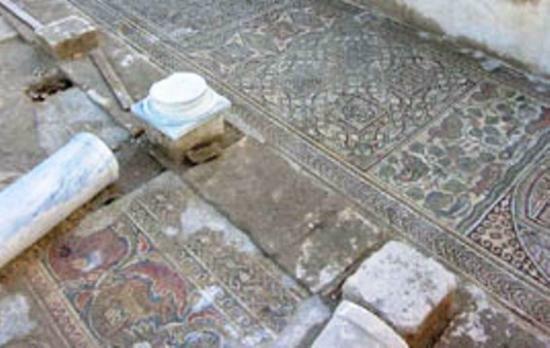 A large and beautiful mosaic floor and a church were uncovered in excavations carried out by the Israel Antiquities Authority at Hirbet Madras in the Judean coastal plain. Various scholars who visited the site during the excavation proposed identifying the place as the residence and tomb of the prophet Zechariah. In recent months an archaeological excavation was conducted at Hirbet Madras in the wake of an antiquities theft during which robbers attempted to breach and plunder an ancient underground complex. Hirbet Madras is known as the site of a large, important Jewish community from the Second Temple period until its destruction during the Bar Kokhba Revolt in 135 CE. Among the remains at the site are those of buildings, caves, agricultural installations and extensive underground hiding tunnels. The site was identified by a number of scholars as the location of a major community. Research of the site was begun in the late 19th century and continues until the present. In the 1980s, a lintel bearing a unique decoration was discovered at the site. Due to the similarity between it and an identical lintel from the Hirbet Nevoraya synagogue in the north of the country, Professor Amos Kloner and the late Dr. Zvi Ilan put forward the theory that an ancient Jewish synagogue is located nearby. Recently, in the wake of the illicit excavations by antiquities robbers, the lintel was rediscovered by inspectors of the Israel Antiquities Authority Unit for the Prevention of Antiquities Theft. Following the discovery, an excavation was carried out with the aim of revealing the secrets of the monumental building which the lintel belonged to. The excavation, on behalf of the Israel Antiquities Authority, was directed by Amir Ganor and Alon Klein of the Unit for the Prevention of Antiquities Theft. A public building of impressive beauty dating to the Byzantine period, in which there are several construction phases, was exposed in the excavation. In the last two construction phases the building was used as a splendid church. However, based on the results of the excavation and as evidenced by the artifacts, it seems that this church is built inside a large public compound from the Second Temple period and the Bar Kokhba Revolt, which was used in the first construction phases of the compound. All of the floors in the building were adorned with spectacular mosaic floors decorated with faunal and floral patterns and geometric designs that are extraordinarily well preserved. Located behind the platform are two rooms, one paved with a marble floor and the other that led to an underground tomb devoid of any finds. Branching out beneath the entire building is a subterranean hiding complex in which there are rooms, water installations, traps and store rooms. This complex belongs to the large building from the Second Temple period which the Byzantine church was built into. Among the artifacts discovered in the hiding complex are coins from the time of the Great Revolt (66-70 CE) and the Bar Kokhba Revolt (132-135 CE), stone vessels, lamps and various pottery vessels that are characteristic of the Jewish population from the community at that time. As previously mentioned, researchers who visited the site are of the opinion that the site is the residence and tomb of the prophet Zechariah. Ancient Christian sources identified the burial place of the prophet Zechariah in the village of Zechariah, and noted that his place of burial was discovered in 415 CE. The researchers believe that in light of an analysis of the Christian sources, including the Madaba Map, the church at Hirbet Madras is a memorial church designed to mark the tomb of the prophet Zechariah. This issue will be examined and studied in the near future.